The Global Mosaic Project brings community-based public art, entrepreneurial training and art education to communities across the globe. We partner with organizations, schools, community groups and businesses to develop unique participatory projects, designed and implemented through social engagement. Our mission is to foster positive community engagement through the creation of site-specific works of public art, leaving a legacy of neighborhood beautification, community cultural development and arts training for all ages. Global Mosaic Projects highlight the Power of Art in communities, focusing on the creative process and affirming that community-based art can be a vehicle for social change by empowering participants, transforming environments and contributing to collective healing and economic development. Founded by public artist, Laurel True, The Global Mosaic Project grew out of True's more than twenty years of experience creating community-based public art, architectural mosaics and a respected teaching practice. The Global Mosaic Project is an ongoing project of True Mosaics Studio. Projects include mosaic murals, sculptural forms, benches and other site-specific work. Projects are created using ceramic tile mosaic, glass, mirror and mixed media. Local materials are sourced and recycled materials are used as much as possible. The Global Mosaic Project offers art education to participants who oftentimes do not have access to formal arts training. In communities where arts programming is available, project participation can offer new skills and techniques, or add a dimension of social practice and service learning to established curriculum. We provide age-appropriate lessons and training to participants in basic mosaic setting techniques, in tools use and design development. This is done through both grassroots and structured programming models and implemented either in or outside of a classroom setting. We offer specialized training for teachers, artists and tradespeople in design development, project creation and project management for group projects. This not only ensures future program sustainability, but also allows the process of creating public mosaics to spread to other communities. We facilitate community partnerships and cross-cultural exchange between artists, schools and community groups in the US and in host countries, helping to build cultural bridges and encouraging dialogue and creative exchange between communities across the globe. The Global Mosaic Project supports economic development and social entrepreneurship in the arts. We work with artists and crafts people, offering design consultation in craft development and product design for items to be sold in local and foreign markets. Projects add welcoming color, positive messages and joy to public and community spaces. They bring vitality and commerce back to formerly blighted or forgotten areas and create beauty in places where basic needs overshadow all else. Projects foster teamwork and cooperation among participants, sometimes sparking the implementation of other projects, activities and programs in the community. Projects help to lay the groundwork for economic development not only by training individuals, but also by making business districts and storefronts more welcoming. 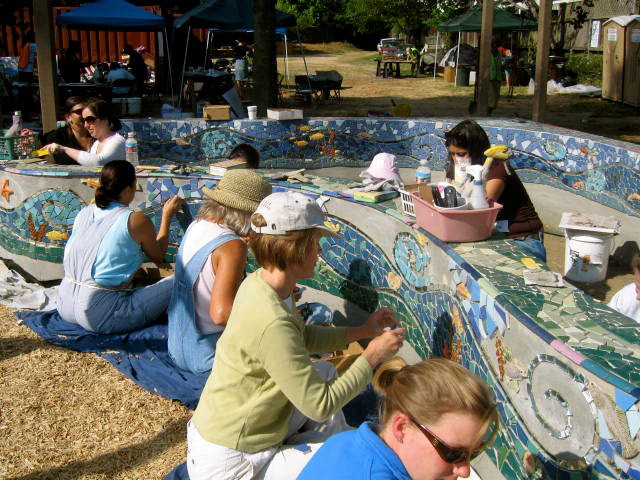 Mosaic art is a very accessible art form, which invites participation by anyone who has the desire to try it. Participants find affirmation through the process of creation and the act of making and building something tangible. Art is an important tool for building hope, providing an outlet for personal expression and lifting spirits in communities affected by loss, disaster and poverty. Participants become teachers and teachers become students as knowledge and experiences are shared among and between participants during all phases of a project. This exchange is an essential part of the Global Mosaic Project. We offer lectures, inspiring speaking engagements and seminars around the US to share our experiences of working with communities on global projects. Special-focus seminars and professional development workshops offered in the US provide valuable content to community builders who wish facilitate projects in their own communities, guiding adult students in pedagogy and methodology for successful project facilitation, management and execution. Global Mosaic Projects leave a legacy of experience, inspiration and motivation with project participants. Many have gone on to create projects in their own communities, passing on program benefits, beautifying neighborhoods, engaging new participants and affirming the Power of Art. Tax-deductible donations directly support our programs. Our fiscal sponsor is Fractured Atlas. Photo 3: Sycamore Park Sandbox, Mill Valley, CA. In partnership with Leathers and Associates. Photo 5: Twin Thrones Bench, Duboce Park Playground, San Francisco, CA. Community project n partnership with Friends of Duboce Park. Photo 6: Detail, Sea Spirits Mural, Jacmel, Haiti. Community mural project In partnership with Art Creation Foundation For Children. Photo 7: Respect the Earth, community mosaic mural in Nungua, Ghana. In partnership with Cross Cultural Collaborative, Inc.
Photo 9: Student participants from Opportunity Impact at Hayes Valley Playground Project, San Francisco, CA. In partnership with Trust For Public Land. Photo courtesy of Trust For Public Land. Photo 10: Student at Rudolph Steiner School, Mbagathi, Kenya working on design materials for Ngong Hills Mural. Photo 11: Principle Mwakai Shake and teacher Philisia Shake working on Ngong Hills Mural at Steiner School, Mbagathi, Kenya. In partnership with Kitengela Glass. Photo 13: Commemorative Community Bench Project (1 of 9) in Jacmel and La Montagne, Haiti. In partnership with Medair International. Photo 14: Teaching introductory mosaic techniques at Art Creation Foundation For Children, Jacmel, Haiti. Photo 15: Handmade aprons made by artist Vicky Dzeklo and her women's group in Nungua, Ghana. Photo 16: Charles Louis in front of the Jacmel Memorial Mosaic Wall, Jacmel, Haiti. In partnership with Art Creation Foundation For Children. Photo 17: Withny Charles working on the Jacmel Memorial Mosaic Mural, Jacmel, Haiti. In partnership with Art Creation Foundation For Children.